Can Lahmeyer produce a master plan to connect electricity grids across seven Central African countries? The answer is definitely “yes”! I shared about how we got started in this previous post. But there’s lots more to the story. Discover it below. Let me begin with a reminder about the details of this mega project. The European Commission contracted us through the French consultancy IED to produce a “regional masterplan” for electricity generation and transmission to replace the fragmented system that has kept the region from realising its tremendous energy potential, especially for hydropower. The seven countries involved: the Democratic Republic Congo (DRC) plus the six countries in the Economic Community of Central African States (ECCAS): Cameroon, Gabon, Chad, Equatorial Guinea, the Republic of Congo and Republic of Central Africa. 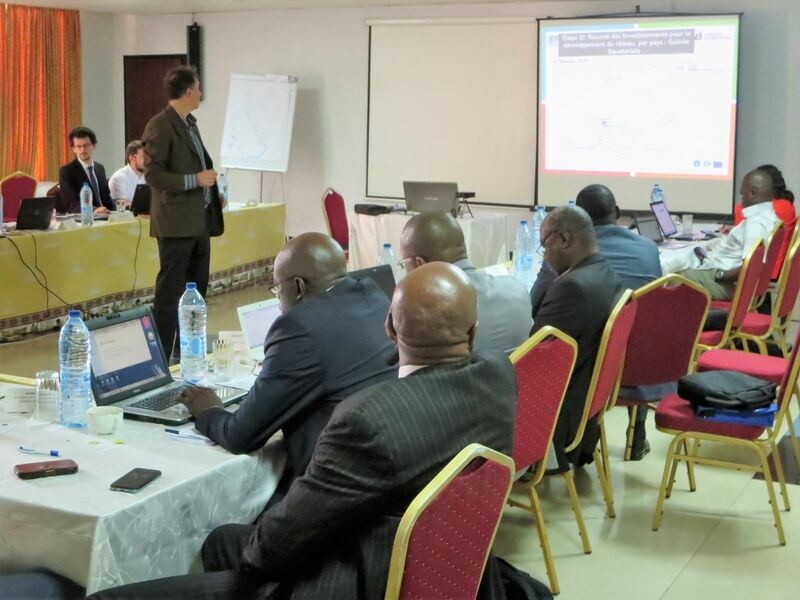 We presented our solution in Douala (Cameroon) to the delegates of the seven participating countries. In the planning, we have considered 78 explicit generation candidates (for hydro or thermal power plants) plus 15 generic, yet always discrete generation candidates (thermal power plants). So, in total around 200 generation candidates. For possible grid extension we have considered 375 different energy transmission candidates. All in all, we had thus 575 expansion candidates. Those of you who are familiar with combinatorics know that each single candidate can be there or cannot be there in each year. It gives thus two possibilities for each option. Together for all options, this means there are 2 at the power of 575 = 1.2 x 10173 possible configurations of the energy system in each year. Given the fact, that in each year a different power system configuration can occur (at least within the expansion optimisation), this means that possibly 1.2 x 10173 at the power of 20 = 7 x 103461 expansion paths had to be compared to each other in terms of the supply costs. OK, these are theoretical numbers. In reality, not all candidates can occur in each and every year. And also, not each system configuration in a given year can be followed by any other system configuration in the next year: If, in one expansion path (branch of the expansion tree), in one year, plant x has been built, then it cannot vanish in the next year. Nonetheless, the complexity was very high. And we had to find reasonable heuristics to come to a manageable number of computations. For managing the complexity, we have introduced advanced combinatorics such as candidate sequences, candidate dependencies as well as combined candidate projects within our combinatorics module. Given the fact, that we’ve carried out real time continuous dispatches for each single expansion option and hydrological condition, the optimisation took us quite a while. After completing months of research, we finally came to a conclusion. Our studies clearly showed that building a regional grid is in fact the best solution given Central Africa’s tremendous hydropower potential. Our solution would reduce the electricity supply costs within all grid zones in contrast to the fragmented system that exists today. With new bold transmission capacities, it will be possible to both export cheap electricity and reduce the reserve capacities in the national power supply systems. This will also help to reduce costs and enhance supply security. This graph shows the evolution of the energy flows between the different countries. Graph: Evolution of energy flows in the reference scenario within 2016-2035. Our solution reinforces the links within the existing subsystem of the Republic of Congo and DRC. Inga’s production can feed the increasing demands from Kinshasa and Brazzaville. It creates another subsystem with grid zones geographically close to each other between Equatorial Guinea, Gabon and South Cameroon. A third subsystem is established between North Cameroon and Chad. It creates large benefits due to the exchange of cheap hydropower. We found it cost-optimal to commission these lines around 2026. By this time, the regional backbone (“dorsale”) should be completed to export cheap hydropower to the North. In 2028, a direct link between Inga and Pointe Noire should be realised. Closing the loop between the Congos should also help to ease exports of cheap Inga power to the North. We found it economically attractive to use hydropower plants – other than just Inga – in North Gabon and South Cameroon to supply domestic demand and export energy. This should begin around 2030. Although we intensively studied options to integrate all countries and grid zones to take benefit of the interconnection, ultimately, we had to leave some out as the graph shows. This is because our reference scenarios focused on “least cost” criteria. Connecting all the grids would have made supplying electricity far more costly. Finally, it was time to present our solution to our clients and stakeholders. The 21 representatives from the seven Central African countries were impressed by our technical and economic findings, but we had left out a major consideration: politics. While leaving some areas disconnected from the regional grid would save money, it would be politically unpopular. We understood and went back to work. Our next step: produce another scenario that strives for greater inclusivity while still prioritising “least cost” solutions. This new scenario would consider higher energy demand in all zones, especially given emerging mining activities in the Ouesso zone, which covers North Congo, North-East Gabon and South-East Cameroon. The graph below shows our second scenario, characterised by a much faster interconnection. Graph: Evolution of energy flows in the accelerated scenario within 2016-2035. By 2022, the “dorsale” is realised between Inga and South and East Cameroon. By 2025, a second North-South transmission corridor is established. It connects the Congos subsystem to large demand and generation centres in South Cameroon via Ouesso. In parallel, the East-West transmission corridor from South Cameroon to RCA is realised. It connects Bangui and Dimoli to the West and South. A further mesh is introduced with the commissioning of the Libreville – Pointe Noire line. By 2026, North Cameroon and Chad are connected to the grid in South Cameroon and Bangui. This creates another mesh in the Northern part of the region. After 2026, different lines are reinforced to allow for larger power exchanges. As the politics required, this scenario allows for power exchanges between all grid zones by 2026. The planned power system will have three backbones. By combining local knowledge with our Lahmeyer expertise, we made this project a success. The relationships we built with our partners and stakeholders proved absolutely critical. We needed national utilities, for instance, to do more than just receive data on power plants and transmission lines. We needed to hear their views about and experiences with existing national and regional expansion plans. To learn from their views and perspectives on different expansion plans as well as other relevant aspects eased our efforts in modelling and substantially reduced complexity for our team. For me personally, I’ve learned that techno-economic optimality does not always assure to yield the best results. When I look back on this project, the best parts will always be the people and the relationships our team built over one year. Getting to know the seven diverse and fascinating Central African countries at the heart of this project was also a major highlight and made this project for me one of the most interesting projects. The region is blessed with a stunning potential for very economic hydro power. To tap this potential, the countries have to succeed in building up a regional grid. Once this step is done and the grid enables synergies, then, I can confidently say that the energy future of this region looks bright.